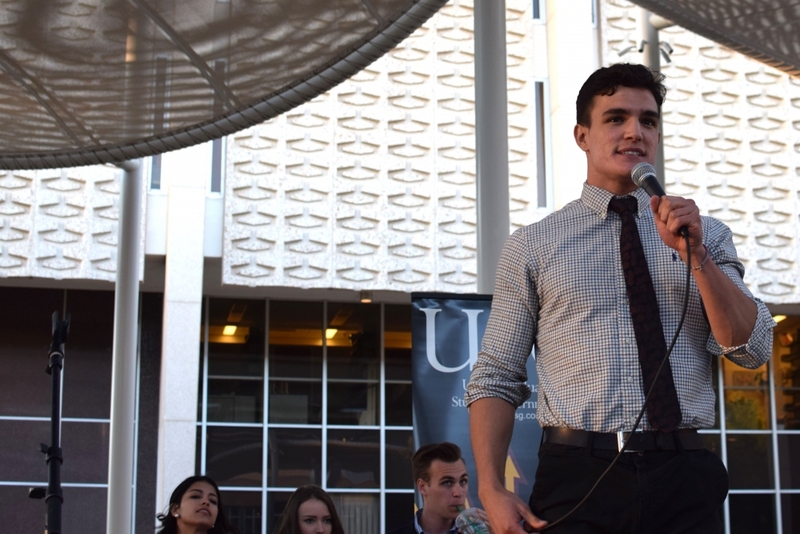 Tempe Undergraduate Student Government elections commissioner Anthony Zlaket moderates the USG debate held in the North Plaza of the Memorial Union on Wednesday, March 23, 2016. The candidates represent a wide swath of experience and involvement, with USG veterans Aundrea DeGravina and Brandon Bishop, as well as relative newcomers Grady Eldridge and Niko Vlastos. 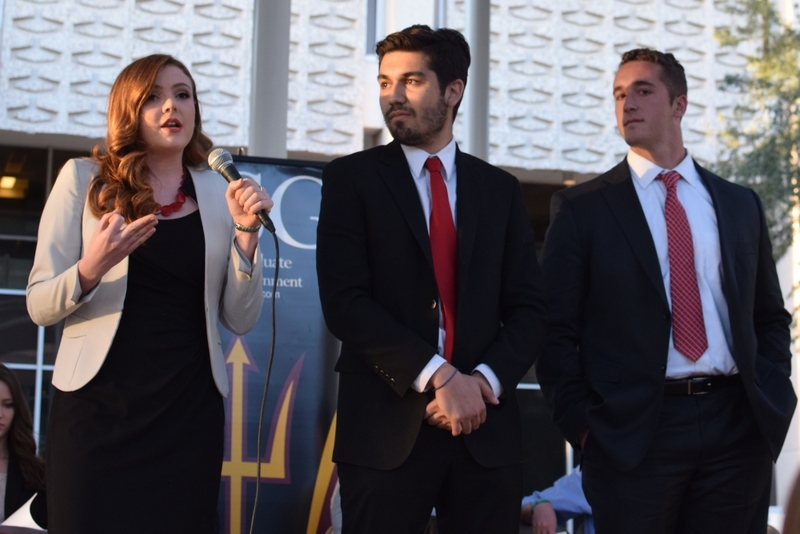 The debate was conducted in multiple stages, beginning with introductions from each candidate, and continued through questions from Tempe USG election commissioner Anthony Zlaket, candidates and the audience. As potential representatives for the nation's largest University, the candidates put a major emphasis on the issue of the school's environmental impact. Sustainability is an especially significant part of the Vlastos campaign, which advocates for increased use of compost bins in the Memorial Union and a greater amount of water bottle fill-up stations throughout campus. "Composting is something we do here that needs to be done better," said the Vlastos campaign's potential Vice President of Policy Torrey Thompson. "We want to use the resources at our disposal — that is ASU 101 classes — and start to make an entire topic out of it that will be taught in that classes that will say how to responsibly compost." The Vlastos campaign wants water bottle fill-up stations in every building, he said. The DeGravina campaign's potential Vice President of Policy Monti Alvarenga also highlighted her campaign's sustainability goals. "There actually is something already within appropriations that Aundrea and Alex overhauled to do, a measure for sustainability when funding events," she said. "Something our ticket feels very strongly about is having a measure on a scale of one to 100 — a linear scale — of how sustainable your event is. If USG is sponsoring your event, it should have a certain level of sustainability to it." The DeGravina campaign also advocates for paperless testing and only providing receipts in dining halls upon request, she said. Mental health, specifically the use and effectiveness of University counseling services, has been a hot-button topic all year, playing a big role at the debate. "I think the biggest thing we need to do is education," said Bishop campaign's potential Vice President of Services John Lauro. "By ensuring that every single freshman who comes to ASU goes through the types of problems they can be exposed to, and how they can fix it or how they can find the resources to help them deal with it, I think everyone will be more equipped to handle these problems." The Vlastos campaign emphasized partnering with some outside the counseling department to help address mental illness. "We want to partner with our psychology majors in the Ph.D or masters programs," said Vlastos campaign's potential Vice President of Services Alex Rudolph. "They can help train students to recognize depression and suicidal thoughts in other students. We also want them to partner with academic advisors so they can see the signs appearing in students as well." Finances played a major role in the discussion of treating mental health issues on campus. "One of the cool things we want to roll out is a pilot program for grants for mental health," said DeGravina campaign's potential Vice President of Services Alex Arena. "A sum of money between $5,000 and $10,000 is set aside for grants that will be accessible to ASU counselors. If they're seeing a student and they think they're going to stop being seen because of financial reasons, they can access this grant money from USG," he said. Eldridge campaign's potential Vice President of Services Kevin McCawley reiterated this thought, calling to set aside money to help students afford counseling and partner with coalitions and organizations to increase awareness of mental health services. In light of ASU President Michael Crow's recent tuition proposal, cost-of-attendance became a major talking point at the debate. "This all stems from not being supported by our state legislature," Brandon Bishop said. "I do not believe our tuition should have been increased. I believe it should have been through a surcharge. We pride ourselves on being the most accessible university, but we keep on raising tuition." The DeGravina campaign came equipped with a multi-step plan to combat rising costs. "In order to combat this problem, my ticket has come up with a two-part plan," DeGravina said. "During our first semester, we gear up students from multiple different types of organization. We need to prepare students so they have the tools necessary to advocate on behalf of themselves. Our second part is to move this into action — making sure we're at the state legislature once or twice a month." Meanwhile, the Eldridge campaign emphasized unity in action, Eldridge said. "Let's make some s--t happen," he said.